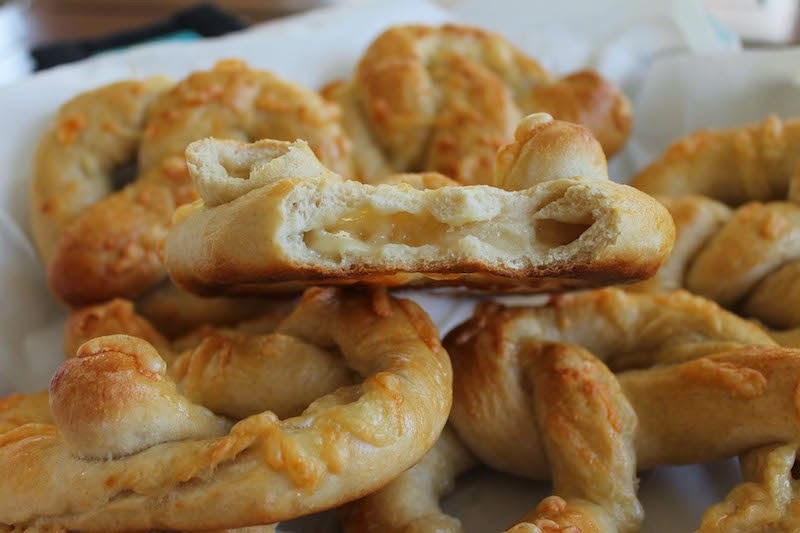 These pretzels are a bit fiddly to stuff, but the chewy texture created by the melted cheese inside is well worth the extra effort. And, honestly, it took very little time. My husband is a good sport. 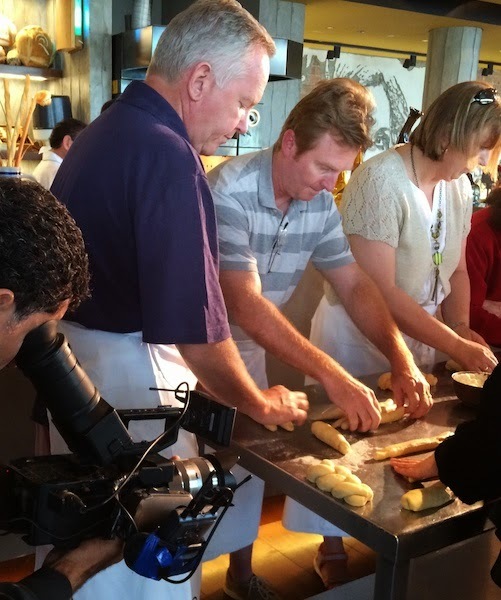 Last year I signed us up for a bread making class, so that we could accompany a couple of good friends who are interested in culinary pursuits. We ate breakfast, drank coffee and took notes while German master baker, Chef Rainer Scharold mixed flour and yeast and butter into a wonderful soft brioche dough, all the while explaining those steps but expounding on the virtues of real German pretzels. He asserted that the lye bath before baking was absolutely essential to achieve their proper golden brown color, then he dashed our hopes by saying it was not available in the UAE. So, when it was our turn to get our hands on the dough, we made little braided brioche loaves instead. I must admit that part of the fun for me was watching my husband roll out his three strands and then braid them, not his usual métier. He’s more of a hammer and nails get-things-done type. Such concentration! That's him in the middle. Much to my delight, I found a short video of our very class while searching for information on the chef so I'll put a link at the bottom of this post for anyone who wants to watch. 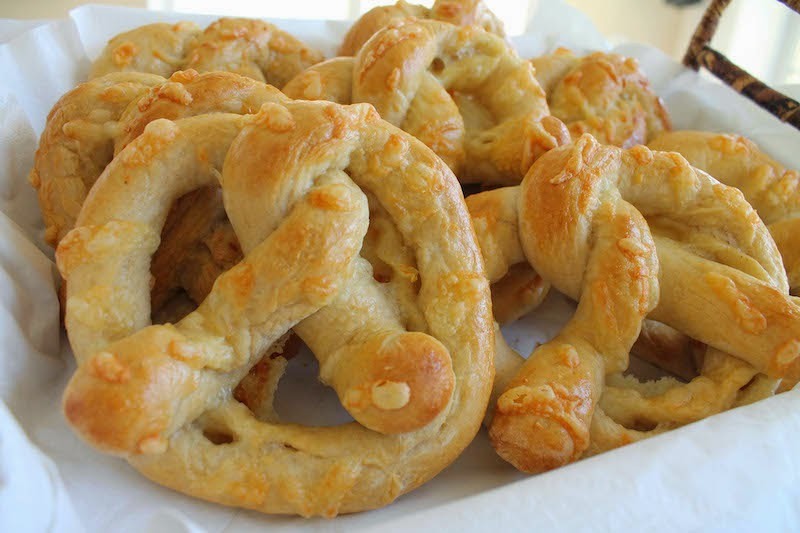 The point of this story is that when the “pretzel” theme for this month’s Foodie Extravaganza Party was announced, I knew I wasn’t going to be able to make traditional German ones here without lye, but I had learned from the bread class that an egg wash helped with the browning. That would have to do. And instead of boiling them in water before baking, as some folks on the internet suggested, it occurred to me that I could probably add chewiness to my pretzels from the inside by stuffing the dough with cheese. I was right. These were fantabulous straight out of the oven but they also made wonderful sandwiches in the next couple of days, sliced in half and filled with roast chicken or salami and mustard with even more cheese. 7 oz or 200g Tomme de Brebis (a semi-hard cheese made from sheep's milk) or other strong cheese - A good sharp cheddar would work well too. I used a little bit of this for sprinkling on before baking as well. In a large bowl, mix the sugar and the yeast and add the warm water. Stir or swish the bowl around to mix the yeast in. Leave for a few minutes to make sure your yeast starts foaming up, which means it’s still active. Add in the cup of whole wheat flour and the salt. Mix well. Add in the bread flour a cup or so at a time, mixing well in between. You should end up with a sturdy but pliant dough. Knead thoroughly for at least five to seven minutes. Set aside to rest, covered in cling film, for about 10 minutes. Meanwhile, grate your cheese and prepare your baking pan by lining it with parchment paper or a silicone mat. Now use a sharp knife to divide the ball into eight equal pieces. Roll them out into sausages about 22 in or 56cm long and then flatten the sausages. Add healthy pinches of grated cheese all along the middle. Start at one side and pinch the dough together the whole length of the roll, enclosing the cheese, and trying not to leave any air inside. Fold the seam over just a little to make sure it won’t split right back open. Make an upside down U shape with the dough roll and cross the ends over. Now cross them under again to make a little twist. 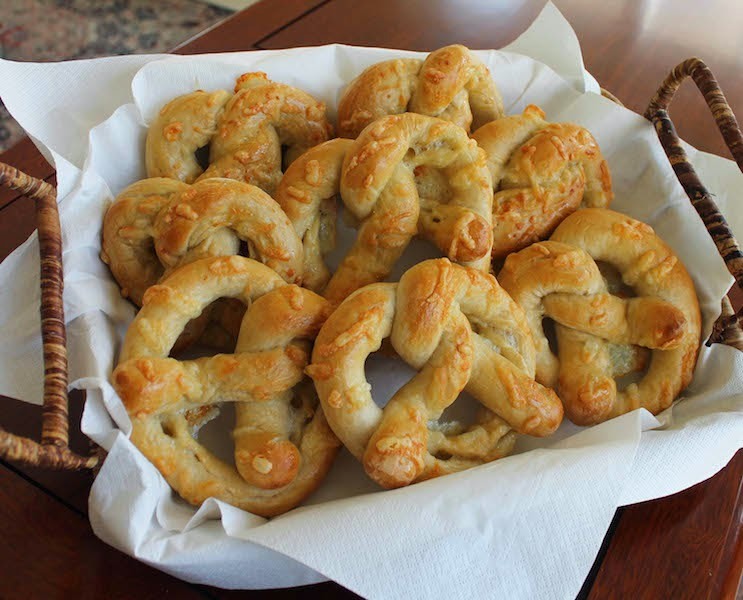 Bring the crossed ends up and lay them on the circle of dough and move the pretzel to your prepared baking sheet. Continue until all the the pretzels are done. Make sure to leave some room between them on the cookie sheet for when the dough rises. My cookie sheet isn’t very large, so I put the first four on the prepared cookie sheet and then put the next four on another piece of parchment so I could slide that easily to the cookie sheet when the first batch were baked. Brush the pretzels all over with some of the beaten egg and sprinkle on grated cheese, if desired. Put the pretzels in a warm place to rise for about 15 minutes, while you preheat your oven to 425°F or 220°C. Bake in your preheated oven for 10-15 minutes or until desired brown color is reached. Dough adapted from this recipe at Sally’s Baking Addiction. We are a group of bloggers who love to blog about food! And each month we all incorporate one main ingredient or theme into a recipe. This month we are celebrating pretzels. We hope you all enjoy our delicious pretzels this month and come see what next month's new ingredient or theme is. 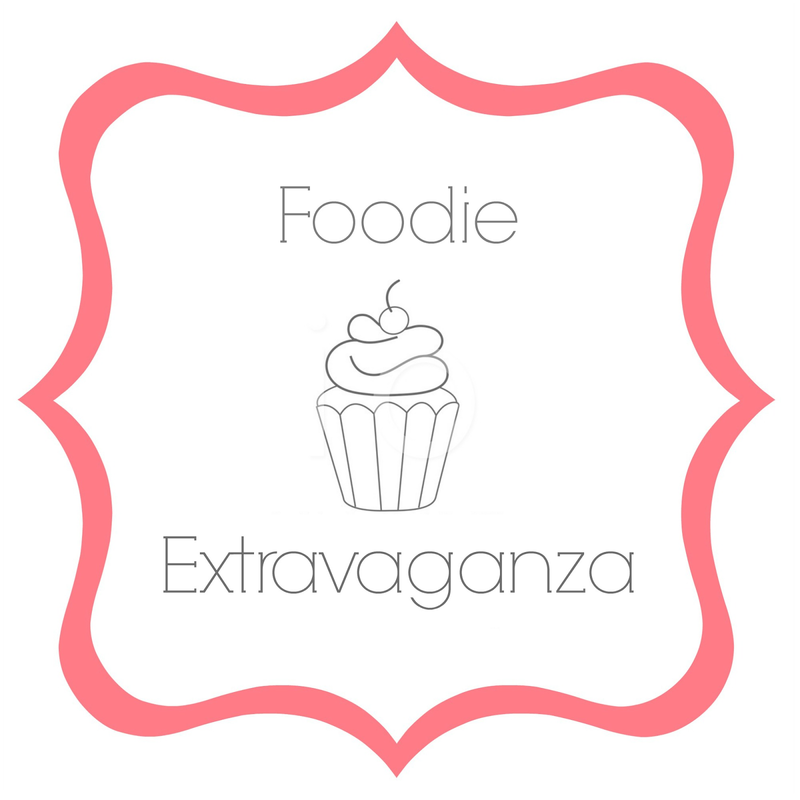 If you would like to join our group and blog along with us, come join our Facebook page Foodie Extravaganza. We would love to have you! If you are a fan of pretzels, this month’s Foodie Extravaganza, hosted by Lauren of From Gate to Plate, is right up your twisted alley! The video - I'm in the purple t-shirt.